If all your degree does is get you a job, you’ve missed an opportunity. We believe you have an important role to play in the world, so every aspect of our student experience is designed to prepare you to succeed not only in your career but in life. It’s why we are committed to providing a higher education that combines cutting-edge scholarship with the wisdom provided by a Christian foundation. 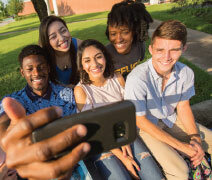 At Houston Baptist University, you will join a diverse community of students who share your values and a core curriculum designed to help you think critically, creatively, and ethically—all of which are keys to success no matter your chosen field. Through learning communities, student organizations, and other campus activities, you will foster meaningful and long-lasting relationships. Small classes with faculty who know you personally and are committed to your success will help you thrive at HBU. All across campus—from the classroom to the Residence College—you will be challenged to deepen your faith, develop your leadership skills, and cultivate a sense of civic duty. You will learn from and collaborate with our nationally acclaimed cadres of scholars and ministry leaders. In seeking answers to the questions that have defined the human experience, you will engage with great thinkers of history and study works that have stood the test of time. The Honors College experience is carefully crafted for students who are serious about their intellectual, social, and spiritual growth. Students and faculty unite in a search for wisdom that surpasses a simple accumulation of facts through an enhanced general education program. The combination of challenging scholarship and significant faculty mentoring is excellent preparation for prestigious graduate and professional schools. 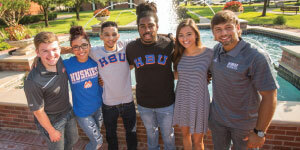 Despite rising tuition across the country, HBU has kept its tuition well below the national average for private four-year universities. Add generous scholarships, grants, and other financial aid, and you’re all set for an education that will reward you for the rest of your life.